The 2018 America's Health Insurance Plans (AHIP) Institute & Expo will take place in San Diego, California, June 20-22. 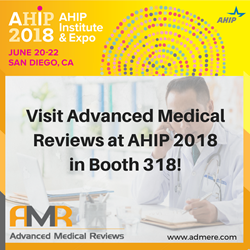 Advanced Medical Reviews (AMR), a designated AHIP Affiliate Organization Member, is proud to return as an AHIP Exhibitor in booth 318. The 2018 America's Health Insurance Plans (AHIP) Institute & Expo will take place in San Diego, California, June 20-22. Advanced Medical Reviews (AMR), a designated AHIP Affiliate Organization Member, is proud to return as an AHIP exhibitor in booth 318. This conference provides the opportunity for healthcare professionals across the country to come together and engage in creative, collaborative thinking to develop and present a brighter future for patients and providers. AMR is excited to meet with 4,000 other health care professionals to discuss advancements in patient care.